DIEHL [email protected] Hydrometer Software is an energy data management software that performs automatic readings of M-Bus and Fixed radio networks. DIEHL [email protected] Hydrometer Software features various modules that makes it possible to adapt the software to the user’s specific requirements. Supports direct USB connection to a IZAR HANDHELD PSION device and the organisation of Walk-by/Drive-by tours for reading/management of radio meters and customer data. Supports data download from an FTP server that was uploaded via Ethernet LAN or GPRS from a fixed installed data concentrator (IZAR RECEIVER LAN/GPRS or M-Bus Master IZAR CENTER). Supports direct connection via USB, RS232, Ethernet LAN or analog/GSM modem connection to an IZAR CENTER M-Bus master. Possibility to do on demand meter readings or readout of IZAR CENTER Memory data. 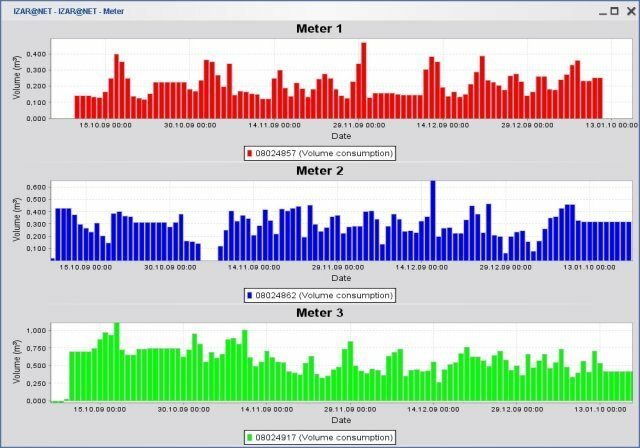 Consumption monitoring: illustration of up to 6 meter counts in a bar or line graph diagram. 3 diagrams can be displayed in one window (also with the possibility of an online mode). Automatic creation of meter alarms for Fixed Network and M-Bus installations, visualisation on screen or transmission via SMS / email. Visualisation of readings on a map (Requirement: Google Earth® installed). Interface for import and export of meter and customer data e.g. from/to a billing software system (ASCII, Excel®, ODBC database connection). Calculations of virtual meter values (e.g. summarize all sub meters from one building). Extension of limited (4 GB) Oracle® Express Edition (incl. in [email protected]) to unlimited Oracle® Standard Edition One database. Allows additionally a higher database performance.